I am so happy that boyfriend jeans are sticking around for another season. I definitely wasn't ready to give these babies up. They are just way too comfy! And one of my favourite looks is to wear casual BF jeans with a cute pair of heels. It's a way to be super casual but the heels dress it up just enough. 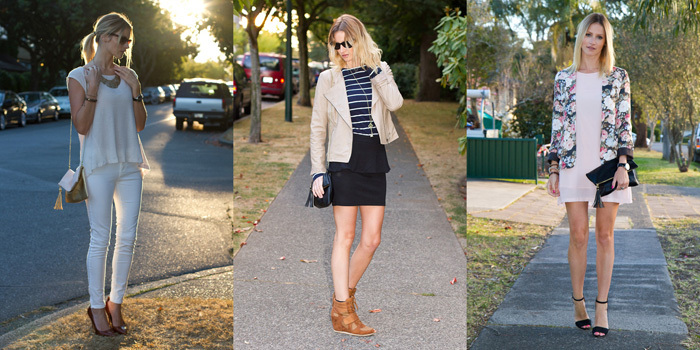 One of my favourite bloggers is Christine of Fash 'n Chips -- she's the queen of this look. Looking at these photos is really reminding me that my tan has fast become old news. I miss that thing! I refuse to go to the tanning salon, so I will be gradually getting more and more ghostly as the months go (yes, I do become more pale that this!). This eliminates a whole colour palette from my wardrobe, but luckily black will always be my friend and tights will hide my pale legs! Isn't it so nice to take a random day off of work? Just knowing that everyone else is doing the same old routine, but you have the freedom to do whatever you like. This is exactly what I did on Thursday and it was wonderful! I had a little sleep-in, worked on the blog, went to meet Ollie for lunch and ran a few errands. Nothing extra-ordinary, but it was exactly the recharge that I needed. These photos were taken during our lunch, at the top of Stanley Park. We only had about 5 minutes to get these in, but I really wanted to show you my new coat from Topshop! I was looking for something that was nice and over-sized, with a bit of colour that could go with pretty much anything. I found this one and have been wearing it pretty much every day since. It is so comfy and I love the boxy shape of it. Maybe not the most figure flattering of all shapes, but boxy tops always make the legs look much leaner, and who wouldn't want that? Plus, I'm super obsessed with menswear inspired pieces right now and thought this would be a simple way to incorporate it into my wardrobe. Ollie has been working like a crazy man (meaning no new photos), so I thought I would take this opportunity to do a little Instagram recap. If you aren't already aware, I am a complete Instagram addict. I get upset when I no longer have a new feed of images and am constantly on the hunt for new and fun accounts to follow. So please, let me know your user names so that I can find you on there! I really can't get enough of these fall settings. I was completely dreading fall because along with the change in season come the rain and the cold and the rain and the rain. But now, suddenly I remember how gorgeous fall can really be. Just look at all of these beautiful leaves! Now, this is the fall we know in Vancouver -- rain and lots of it. It's such a shock to the system after all that beautiful sunshine, but like true Vancouverites, we will get used to it in no time. The only problem is that now we're not sure how to shoot my looks while it's raining and dark. Does anyone have any suggestions? I would love to hear them! These photos were taken at Mount Tolmie in Victoria and I really love the way they've turned out. The whole mountain was this beautiful golden colour and I love the way that the sun was beaming through the trees. Such a magical setting. We knew that we were looking for an area with some beautiful fall colours, so I chose to wear a forest green skirt and neutral top. The boots were a must for the uneven ground and these ones seem to go with pretty much anything, so I bring them out whenever I know that there will be a lot of walking. I hope you like the photos and thank you so much for all of your support! The interactions with other bloggers and supporters really does make all the difference. Happy Canadian Thanksgiving! We're having an amazing long weekend visiting my family and friends in Victoria. I really can't believe how gorgeous and warm it is -- it feels like the end of Spring! I hope everyone is having an amazing week! Ollie has been sick, so we haven't been up to too much, but he's much better now. We're really looking forward to the weekend because it's a long one in Canada! We're going to visit my family for the Thanksgiving holiday and see some friends that we haven't seen in far too long. I can't wait! We had to work quite late but still really wanted to take photos, so we ended up snapping a few after Ollie finished his work downtown. I think we're going to have to find some spots that are good in the dark anyway, so this is good practice for the coming months. Which one is your favourite? I would love to hear your opinions! !